Snoring can be annoying for your client's partner, especially if they are a light sleeper and find their periods of rest are disturbed - it can also lead to the break-up of relationships. Snoring is common in almost half of adults at some stage in their life and can be associated with weight problems, alcohol intake or sleeping on your back. Surgery may reduce disruptive snoring - however, this isn't suitable for everyone who snores and is an extreme step to take unless the problem is particularly severe. 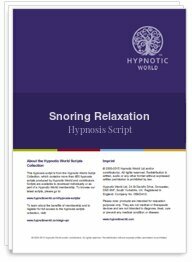 Whilst listening to this hypnosis script download your client will be extremely relaxed and their subconscious mind will be in the ideal state to accept and act upon the suggestions given. Because sleep and hypnosis are similar (the word hypnos translates from the Greek language meaning sleep), suggestions given during the hypnosis session can carry over into the sleeping period, reminding the subconscious mind how to recognize and overcome the habit of snoring.